The swashbuckling adventure of LHK Productions' panto Peter Pan, comes to the Epstein Theatre this Christmas from Friday 8th December to Monday 1st January 2018. Children and adults alike will be whisked away on a sensational journey to Neverland this Christmas. With a sprinkle of fairy dust from Tinkerbell, join Peter, Wendy and The Lost Boys on an adventure full of Pirates, Mermaids, Indians and a devious tick-tocking croc, in this enchanting story of the boy who never grew up. 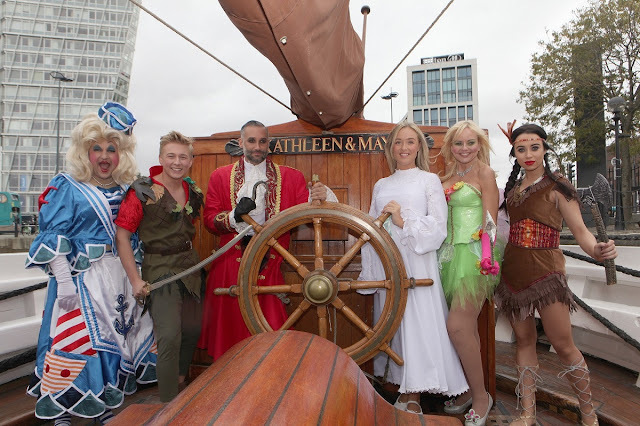 Headlining Peter Pan is Another Level's Dane Bowers, who will have audiences hooked this festive season as Captain Hook. Dane began his career as a member of Another Level, one of the most successful boy bands of the 90's - achieving several platinum selling albums and singles. He has also made appearances on Celebrity Big Brother, Celebrity Come Dine with Me and ITV's The Big Reunion, which saw him form a supergroup boy band with the likes of Gareth Gates. Set to take audiences by storm is Liverpool's own Lewis Pryor who will be playing the lead role of Peter Pan. Lewis appeared in the 2016 series of Britain's Got Talent, finishing 3rd place in the Live Finals as a member of dance troupe Boogie Storm. Supporting Peter Pan will be Radio City 2's Claire Simmo, starring as the lovable Tinkerbell. No LHK Production would be complete without everyone's favourite dame, Michael Chapman, who returns for 2017 as the Darling Family Cook and is guaranteed to bring his usual hysterical capers and comedy antics. New cast additions also include the incredibly talented Joanne Harper as Wendy Darling and local performer Georgia Austin as Tiger Lily. As ever, audiences can expect a huge production from LHK Productions with dazzling sets, sparkling costumes, laugh-a-minute scripts, brilliant songs and exquisite trade-mark choreography that everyone has come to know and love from Liverpool's acclaimed panto production company! Times - Times vary, please visit www.epsteinliverpool.co.uk for more information. Limited number of £11 tickets available on all performances (except Fri 8th Dec 7pm, Tue 26th Dec 5pm and Sun 31st Dec 5:30pm). *Subject to booking fee. All prices include a £1 per ticket venue restoration levy. Call 0844 888 4411, visit www.epsteinliverpool.co.uk or book in person at the theatre box office (open 2pm-6pm Mon-Thu & 12pm-6pm Fri-Sat). Disclaimer: Information correct at time of writing, but can be subject to change. I would therefore always recommend visiting the venues own website to obtain the most up to date information.